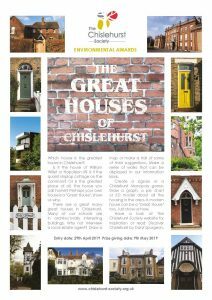 This years popular annual Environment Awards theme is ‘The Great Houses of Chislehurst’. Which house is the greatest house in Chislehurst? Is it the house of William Willet or Napoleon III? Is it the quaint shiplap cottage on the common? Or is the greatest place of all, the house you call home? Perhaps your own house is a ‘Great House’, show us why. There are a great many great houses in Chislehurst. Many of our schools are in architecturally interesting buildings. Why not interview a local estate agent? Draw a ENVIRONMENTAL AWARDS map or make a trail of some of their suggestions. Make a series of walks that can be displayed in our information kiosk. Create a Jigsaw or a Chislehurst Monopoly game. Draw a graph, a pie chart or 3D model about all the housing in the area. A modern house can be a ‘Great House’ too. Just show us how. Have a look at The Chislehurst Society website for inspiration or read Discover Chislehurst by Daryl Spurgeon. Entries to be received by 29th April 2019, Prize giving date is 9th May 2019.